New Pompey signing Jamal Lowe has been named the National League South player of the month. That caps off a memorable October for the former Barnet man, after signing for the Blues and being called up to the England C squad. 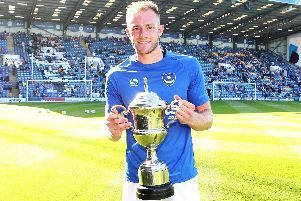 Lowe will officially become a Pompey player in January but four league goals in October for Hampton & Richmond Borough ensured the 22-year-old would be in the running for the monthly accolade. His most recent appearance for Hampton was in a 3-1 win at Weston-Super-Mare where Lowe scored his 33rd goal for the club in 50 appearances. On receiving the monthly accolade, Lowe said: ‘I can’t believe how great this last month has been.